Jammu, April 07- The Minister for Tourism and Culture, Mr. Nawang Rigzin Jora said that Jammu and Kashmir has several heritage sites, reminiscent of its rich cultural heritage, which needs to be showcased for promoting heritage tourism. Underscoring the need for restoration of the past glory of all cultural heritage sites, he asked the concerned authorities to identify all such sites for taking up their conservation, adding it would not only cater to the yearnings of heritage lovers at domestic as well as international level but would act as catalyst for the economy of the state. Mr. Jora said this while visiting Bahu Fort on Tuesday. He directed the authorities for time bound completion of conservation and development works of the Fort. The Minister went round the fort and enquired about works in progress. New Delhi, April 07- Observing that the annual Yatra inflow to Shri Mata Vaishno Devi is likely to touch ten million mark in the next few years, Governor Mr N N Vohra, today called for evolving best possible approaches for providing improved facilities to the pilgrims, as also taking effective measures for preserving ecology in the Shrine area. The majestic Bahu Fort situated on the banks of river Tawi, is the oldest existing edifice believed to be nearly 3,000 years old .It is now surrounded by the lush green and terraced garden called Bagh-e-Bahu. The Bahu Fort has been declared State protected monument and is being developed as a heritage site. The conservation and development work of the Fort has been started during the year 2006 at an estimated cost of Rs. 69.70 lakh. So far, Rs. 45 lakh has been spent on its development. The conservation works include restoration of pristine glory of the monument so that it is developed as a magnificent Dogra heritage site, as the Fort has the potential to attract large number of domestic as well as international tourists. While going around the Fort, the Minister issued instructions to all the concerned authorities to identify other potential heritage sites for their conservation and preservation. During the inspection, the Minister urged the authorities to seek the expertise of reputed artisans of the country for early completion of the project. 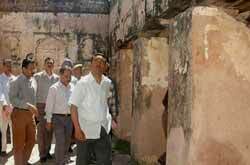 The Minister went round the heritage Fort and took on the spot assessment of the renovation works taken up. He also issued necessary instructions to the concerned for ensuring regular cleanliness within and outside the Fort premises. Director Archives and Museums Mr. K.A Qadri briefed the Minister about various conservation and renovation works taken up. He apprised the Minister that conservation and restoration works of the rampart wall and view points are at final stage while as the restoration of royal residence, water tanks, establishment of photo gallery depicting cultural heritage of Jammu and landscaping in front of the Fort have also been taken up. Superintendent Engineer, JDA, Mr. Chadwal, Deputy Director Archives and Museums Mr. Pankaj Mangotra and other concerned officers accompanied the Minister during the inspection. The Minister directed the authorities to shift the fallen debris around the Fort for creating open space for the landscaping to enhance the aesthetic view of the Fort. He also issued instructions for installation of light and sound system besides early completion of illumination of the Fort for attracting the tourists. Chairing the first meeting of the reconstituted Shri Mata Vaishno Devi Shrine Board (SMVDSB) here this morning, the Governor, who is also its Chairman, said that the Yatra to the Holy Shrine had already crossed seven million mark and added that the increasing trend in the Yatra poses multifarious challenges in terms of infrastructure, sanitation, accommodation, drinking water, electricity and all other facilities related to the Yatra. Elaborating on the measures to be taken on the environmental front, the Governor declared that the preservation of the ecology and the environment of the Shrine area would also be the top priority of the Board so as to make the Yatra sustainable over the long term. ‘For meeting such challenges, appropriate and focused efforts would require to be made by the Board’, he maintained. Mr Vohra also emphasized the need for including the disaster preparedness plans as a part of the Shrine Board’s broader management framework. While welcoming the new Members on the reconstituted Board, the Governor hoped that their invaluable experience shall be of immense help to the Board in evolving best possible approaches for providing improved facilities to the millions of devotees, thronging the revered Shrine to pay their obeisance round the year. During the 46th Board Meeting, various development proposals were discussed in detail and several landmark initiatives were approved. These include the construction of new Durga Bhawan at Bhawan at a cost of Rs. 1.98 crore, the construction of Manokamna Phase-II involving an expenditure of Rs. 4.22 crore with provision of dormitory beds, toilets, blanket stores and Bhojanalya and the construction of Aashirwad Complex at Katra at a cost of Rs. 5.18 crore. The Board also approved the renovation of existing Durga Bhawan complex at the Bhawan and construction of Kalika Dham at Jammu with dormitory accommodation, offices and other facilities within a total cost of Rs. 20 crore. On completion, these projects will create additional accommodation and other facilities for thousands of pilgrims. The Board also decided to get a Master Plan for the entire Bhawan complex prepared for upgradation of various facilities in a planned manner. This would include construction of queue complex and remodeling of Bhawan complexes in a phased manner. In yet another decision, the Board decided to proceed further with the construction of outdoor stadium at Katra, as part of SMVDSB’s social responsibility. The Board also approved increased annual allocation for developmental activities in and around Katra for improving facilities to the pilgrims in the Base Camp. Besides, the Board approved an allocation of 0.82 crore for construction / renovation of Mahadev temple at Reasi. While approving these projects, the Board stressed the need for focused attention on the preservation of ecology. The Board decided to have a comprehensive plan prepared for development / ecological preservation of the entire Banganga area. The meeting also discussed the Gurukul Shiksha Kendra, coming up at Charan Paduka, and decided that appropriate steps shall be taken for its early operationalization so that the first academic session starts from this year itself. During the meeting various decisions were taken regarding welfare of the staff working in Shri Mata Vaishno Devi Shrine Board and stress was laid on Human Resource Development in the Board. Upgradation of health facilities also came up for discussion and various decisions were taken to improve the health facilities, including appointment of Medical Officers for all important locations to provide ‘round the clock’ medicare to the visiting devotees. The meeting was attended by Mr E. Sreedharan, Managing Director of Delhi Metro Rail Corporation, Mrs Sudha Murty, Chairperson Infosys Foundation, Mrs Padma Sachdev, renowned Dogri writer and poet and Dr. Sudhir S. Bloeria, former Chief Secretary of Jammu and Kashmir, all members of the reconstituted Board. Also present were, Mr B B Vyas, Principal Secretary to Governor and Chief Executive Officer, SMVDSB and Mr Manoj Dwivedi, Additional Chief Executive Officer.